Is It Possible To Write Your Midterm Paper Overnight? You may think that writing a three-page term paper overnight is a difficult task but when you prepare yourself before typing the paper, it will be easy to accomplish. You want to avoid any distractions while typing the paper such as the TV and radio because it slows the progress and you will not get the job done. The first thing you should do is prepare an outline of the term paper because you can base the term paper on the outline, therefore allowing you to finish the term paper in an efficient way. It also helps to write all of your valid arguments on a separate sheet of paper so when you start the final draft, you can stay focused on the task instead of spending a lot of time developing the arguments. It may take longer for you to look for errors in the paper and this takes away from your time in revising the paper so to write the three-page term paper quickly, you should have another person in the house proofread your paper so that you will not have to spend a lot of time on proofreading and writing the paper over to correct it. This keeps you from having to stop typing and glance at an instruction book for fifteen minutes to see how to format the term paper in a certain style. For example, if you need to type the term paper in MLA style, you can refer to the cheat sheet quickly before resuming your work. Always double check the formatting before you give it to the professor. 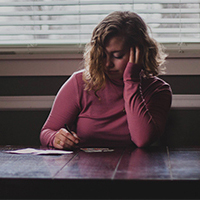 Although it is better not to wait until the last minute to write the term paper, there are emergencies that cause you to wait until then to write the paper. You want to go over the assignment guidelines quickly before starting the paper and then you want to have all of your sources on hand so you can avoid having to visit the library to gather information. When you write the term paper, it is important that you only include credible research for your topic. Finally, you should allow yourself enough time to complete the paper and do not use a classmate's old term paper to pass as your own because this exhibits a lack of integrity.